Stepping Into More – Book Launch – Perfectionists Welcome! Happy Sunday Everyone! February 28th marked the official book launch day for Stepping Into More by Rachel Karu! To celebrate the launch, the author is organizing a giveaway with awesome prizes! I just started reading this today and I said to myself- that’s me! I don’t know if the same will ring true as I read on, but so far the voice, the style, the words are all wonderful. I will be writing a review for Stepping into More and posting in one week on Sunday March 10th. So please stay tuned!! to derail her at every turning point. At the lead of Rachel’s gang of Gremlins was the toughest of them all: Perfectionism. 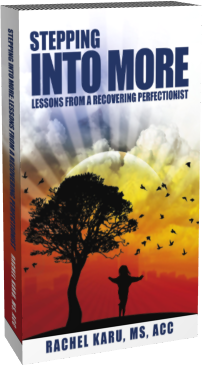 In STEPPING INTO MORE: Lessons from a Recovering Perfectionist, Rachel details her personal journey of wrangling and ultimately co-existing with her Gremlins. We are born with strengths and development areas. Our goal is to create a fulfilling life. But we all need some guidance along the way. Intended as a tool, this guide offers support as you grapple with your own Gremlins and higher self, so that you learn how to make clear, conscious choices that lead to a wonderful expansive life. Rachel’s story and the reflective questions at the end of each chapter are designed to serve as a stepping stone for you to reconnect to and honor your passions, values, and dreams. ~ Sharon Jordan-Evans, executive coach & keynote speaker, co-author, Love ‘Em or Lose ‘Em: Getting Good People to Stay and Love It, Don’t Leave It: 26 Ways to Get What You Want at Work. This entry was posted in Books and tagged Author, Book Launch, Em (typography), Gremlins, Keynote, Nice Girls Don't Get the Corner Office: 101 Unconscious Mistakes Women Make That, Novel Publicity, Perfectionism, Rachel, Rachel Karu, Stepping into More by pattytmitchell. Bookmark the permalink. technical difficulty – should be all set- and thanks again for the heads up! !